Turn digital leads into concrete sales with a cutting-edge digital presence suite and help your dealership to fully embrace Digital Transformation. By quickly deploying a digital marketing-optimized website and building customer loyalty via an ever-present connection with the dealership, OneDealer leaves you in complete control of your online presence. Welcome more customers to the dealership of the future and put the entire experience at their fingertips. Digital Presence enables dealerships to increase their visibility by building a web presence that will be the envy of competition. Your own mobile-ready virtual dealership website can be deployed quickly and then customised fully, without developer skills, to meet your brand guidelines. Multi-lingual support enables dealerships to target a wider customer base than ever before, and built-in SEO ensures prominence within Google’s search results. OneDealer gives you complete control over your digital presence with simple, in-line website content editing and an ever-present channel for communication with customers. For dealer networks, Digital Presence offers full multi-site capability with both central- and dealer-generated content management and deployment catered for. Stock, promotional offers and news items can all be instantly pushed to dealership ‘child’ websites from a centralised platform and advertising banners sent directly to the dealer network. 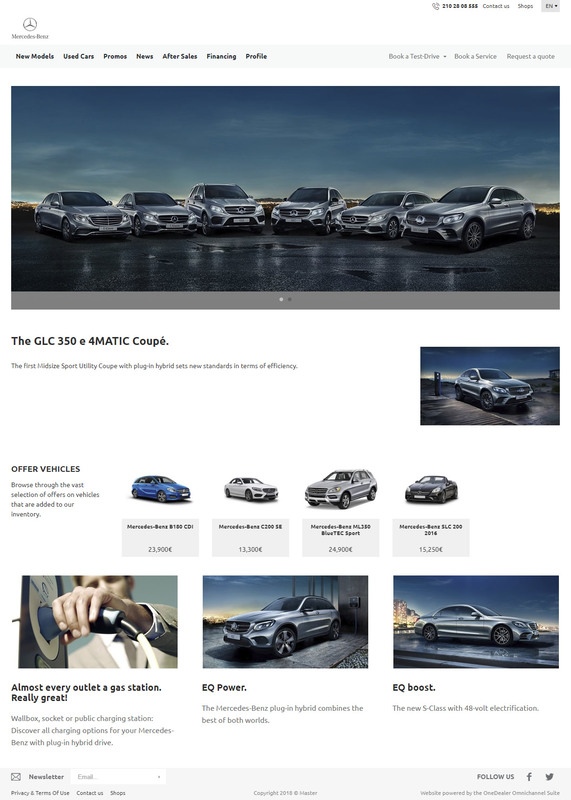 Dealerships which experience rapid growth will benefit from the one-click child website creation with the added capability for each dealer to showcase their own inventory and offers. Now you can connect with more customers than ever before by offering a fully-personalized web and mobile-app based client portal which provides a single, central place for pre-sales and after-sales interactions. New customers are invited to discover your virtual dealership experience by configuring and personalizing their new vehicle, booking a test drive, gaining direct access to their own salesperson and viewing all documentation pertaining to the purchase. All within an intuitive web or mobile app. Existing customers are presented, upon login, with detailed information on their cars including vital milestones, service dates and mileage, tire change, emission tests, MOT test dates, full service history, vehicle and financial documents and personalized reminders and promos, including push notifications. The digital era presents significant challenges for dealerships – unless they allow the virtual side of their business to flourish, with Digital Presence.